I teach mathematics at MSc and PhD levels. My preferred method of teaching is old-fashioned: talking and writing on the blackboard at the same time. Flexibility: whenever this is useful, it is easy to 'deviate from the script'. Natural speed: it imposes a natural speed on the speaker. Preparing slides using LaTeX or PowerPoint and just clicking through them, I find myself proceeding way too fast. Parallel displays: having several boards available for writing makes it easy to keep some text/examples on display on one board, while writing on another. Dynamics: referring to information on the different boards allows me to move through the room, adding a more dynamic aspect to the lecture. Ease: it is a low-tech way of achieving all these things simultaneously with easily available means. The main disadvantage of this method is that I spend a significant amount of time of each lecture with my back to the audience. Question: What would you recommend as a means of communication that combines the six features above (most importantly, the handwriting and parallel displays), but facing the audience? Obviously, a low-budget solution would be appreciated, but my institute is usually pretty generous in investing in technology that improves teaching, so don't let that restrict you! What I tried: Many things, including writing by hand on tablets (iPads, Digital Paper, reMarkable, etc.) and projecting this in the classroom. Perhaps I haven't found the optimal device for this yet, but it often comes out pixellated, delayed, and less readable than my usual handwriting on paper or the blackboard. Using a document camera to project my handwriting on paper works well, but can project only about half an A4 paper at a time to keep it readable for people in the back of the room and, like other approaches, has the disadvantage of not having parallel displays: it's hugely important to be able to keep definitions, examples, theorems from earlier on for easy reference. Do not assume that facing the audience is actually better. It depends on the type of content. For example, if you are explaining a diagram (detailed hydraulic system for instance), you want the audience to concentrate on that, not the presenter. The audience is still getting plenty of stimulation by having a live human voice along with visual content. You actually don't want the presenter to distract the eyeballs from the intricate content. (I see this wrong often with recorded talks where the video operator concentrates on the podium versus the charts, or shows both but with inadequate scale to see the slide charts.) If you are doing math (as opposed to history or literature), the content is more intricate and you should have the audience concentrating on the formulas, not the speaker. Take some occasional time to address the class when that is appropriate. Examples are a "sea story" about test performance or industrial application of the math. But these will be a minor amount of time within a math lecture. I mean, if you really wanted to, you could write backwards in grease pencil on plexiglass like in an old Navy combat information center. But really what is the point. People concentrate on the status (content), not the writer anyways. The one advantage is that you don't have a body blocking part of the board. I believe there are now electronic versions that would flip this around for you (or you can use an OHP). But still I think you lose a lot from having a lot less screen space than board space (especially with sliding boards). So, the small advantage of facing is at the loss of huge amounts of content physical space. There is an extremely simple solution to this, which is that you stand sideways, with the students on your left and the board on the right. When you turn your head to the left, you're looking at your students. When you write, your body isn't blocking the board, or is at most only temporarily and partially blocking it. When you pause to explain something or ask for questions, you can turn your whole body toward the class and step a little to the side so that everyone has a clear view. It's not particularly difficult to write in the sideways stance, and it doesn't even really take any practice. When I call students to the board to present their work, I just briefly demonstrate it to them, and they generally can do it immediately. So, you can have a single slide with a particular expression or theorem that you need often and drop it on as necessary. This answer is going to broaden the question asked to instead be, "How can I give the students a better experience, while still delivering content through speaking and hand-writing?" I would suggest spending dramatically less time lecturing in class. Instead, record the (majority of your) lectures electronically, and share them with your students online. You can use whatever setup you like -- writing on the board(s), writing on paper, writing on a tablet, writing on glass and having the image left-right reversed -- with one or more cameras recording your lectures. You can edit the footage as you like, to allow the parallel displays you enjoy for example. Students can view your lectures at their own pace, at their own convenience, with the ability to pause, rewind, replay, and fast-forward. You can use class-time more effectively, by taking advantage of the circumstance of all these people in the same room. Have them talk to each other! They can work on exercises, or go through details of proofs, or work on more ambitious projects. Small groups are most effective, size 3 or 4. Both of the above benefits are much more important than the ability to see your face during lectures. If the space in which you lecture permits, you could simply put some big mirrors next to or between your blackboards. That would let you continue to write with your back to the audience as you do now while also being able to casually glance at them (or at least some of them) without turning around. Less unusually, if you're in a small classroom setting you could angle your blackboard a bit away from the class. I've seen plenty of rooms that had a portable blackboard positioned like this before, and it allows the teacher to stand to one side of the blackboard and glance sideways at the class while writing. (I suspect that this is not what usually motivates such setups, and that they're typically done due to a lack of space for the extra blackboard at the front of the room, but there's no reason you can't deliberately use this approach for the visibility benefit.) Of course, in the context of a big lecture hall this would be annoying to the class. The document camera is, in my experience, the best approach by far. It has a couple of unique advantages, including producing permanent copies of the lecture notes, both for your benefit when preparing exams and (possibly) for the students' benefit (if you decide to make these notes available, whether to everyone or only in special circumstances). Another advantage is that it's more natural to use than a vertically-mounted chalk- or dry erase-board, so your handwriting comes out more much readable and requires less effort. Finally, it is more accessible to students sitting in the back of the room, where blackboards are generally unreadable due to size, shadows, etc. The only significant drawback is the need for specialized equipment. But if your institution is able to provide that, you should take advantage of it. The limited display capability is not a real drawback. It is quite rare that you need to project more than half or two-thirds of a sheet of paper at a time. It simply isn't feasible to talk about that many different things at once. If nothing else, it forces you to keep in mind the audience's human limitations. If you really need to give a "big picture" view, you can always zoom out on the document camera. While it isn't strictly necessary to make eye contact with your audience, especially since many students will be looking down to take notes anyway, don't underestimate the advantage of being able to actually connect with your students in appropriate contexts. If you are looking out at the class, it's much easier to judge understanding, see those with questions, and just make yourself seem friendly and approachable. Document cameras allow you to face forward and give a natural lecture, while maintaining all of the advantages of a "chalk talk". In my opinion complex concepts which involve a lot of mathematical equations are best taught by interacting with the audience and allowing students to write along with the instructor. Many people have suggested here the use of a document camera. How about a transparent-board camera? He uses dark clothing, dark background and a transparent board to write on facing the audience. A camera captures the board content from the front and then inverts the video to project on a display, so that it is in the correct readable orientation. I don't have a lot to add to these contributors in terms of nitty-gritty details, but I think that if you can get it having a good setup with both document camera AND chalkboard is best. (Or possibly multiple doc cams.) At least, that is my experience with mathematics in a number of different settings. When I am in a room that allows for it, I will have certain definitions just continuously on the board, and then dynamic examples (whether computer-generated or paper) on the camera screen. Or you can use the chalkboard for stuff that has to stay up a long time, for which you know people will be copying down anyway - and then you can stand aside as they (hopefully) internalize. Or, if you have time ahead of time, put needed definitions on some side boards (we have side whiteboards in some classrooms) that you can point to, while keeping attention up front. In any case, you can think dynamic versus static content for the two 'devices' (if a chalkboard is a device). It does depend upon the type of course. Honestly, for graduate coursework you'll probably be flying so fast it won't matter what technique you use. 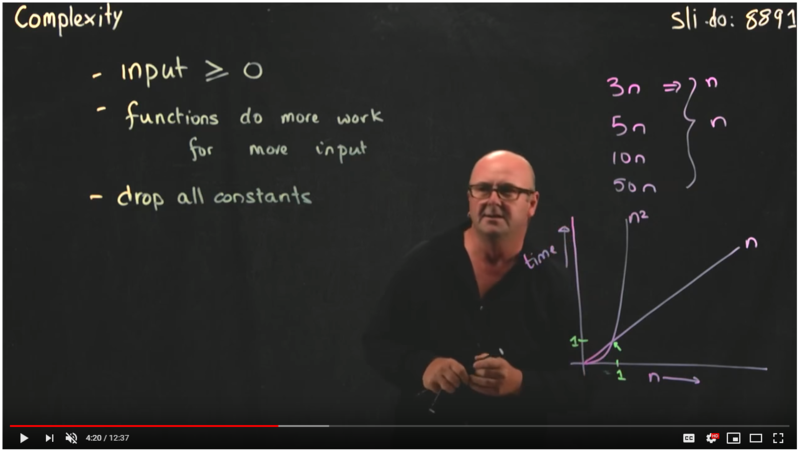 Given the setup of many rooms in many universities in many countries (but not all of any of the above, of course), I would recommend the doc cam + chalkboard combination as an easily attainable via media that gets at most of what you want in a lecture-based course. You could write up the main points one butcher paper, then roll them up and put them on the walls. Then you can write out the detailed steps and project them onto the board, then as you finish a section, unroll the summary. This will also provide a stopping point for people to ask questions. I think one possible solution could be the use of a camera-projector system also often known as a document camera. A common example I've seen in universities around Canada is ELMO your university may consider investing in these and placing them in classrooms around campus. This system also allows for you to switch to any detailed diagrams or animations you may want to present to your class through your laptop hooked up to the same projector. I had such a math teacher in college. He would walk in, start writing on the board, and not stop until the end of class, then walk out. It was horrible. Everyone in the class hated it. A few complaints later, and he started turning around periodically to see if there were questions, and if the class was keeping up. Spending a significant amount of your time with your back to the audience isn't a problem, as long as it's not all of the time. Just check in with the students, and make sure that they know it's ok to interrupt you when your back is turned (assuming you're ok with that). Not the answer you're looking for? Browse other questions tagged teaching lecture-teaching-method technology or ask your own question. How to overcome my resistance to lecturing? What strategy should I follow for lecturing a course in which I have only a basic background? What are the health impacts of standing / sitting while lecturing? How to represent a tensor/matrix/vector/array in blackboard?